We all know that art is an essential part of any décor strategy at home or even in a commercial place. However, art is basically a general term and it can mean many things. As you start to think about your next décor project, maybe it would also be nice to start thinking of art beyond the giant paintings hanging on the walls. Well, one thing you may consider in all this is the metal tree wall décor. Metal tree wall décor pieces are simply sculptured pieces of accents that are mostly made out of pure metal. The pieces are normally used on large high walls but smaller sized pieces can also be used for small normal sized walls at home. When it comes to shopping for metal tree wall décor, things may not be as easy as you’d probably think. But there are some distinguishing factors that may help you choose the right option. Top-rated metal tree accent pieces tend to have textured finishes. Textured finishes are very ideal because of one simple reason - they can easily blend into the wall’s backdrop to deliver a stunning look. Consider the size of the tree too. Ideally, if you can get the bigger more imposing tree wall décor pieces then you will be good to go. Pay attention to the type of tree too. Some people may like simple minimalist trees with few branches and small stems while others may consider huge trees like acacia. Although there’s nothing wrong with small minimalist tree types, we often believe that the richness of large sized tree designs (such as acacia) and the fullness of their leaves can really make all the difference in your home. This perfect medium sized metal wall décor is designed for the contemporary homeowner. The design features three unique palm trees carefully interwoven to deliver a stunning finish. They are made out of 100% copper. The trees are shiny, classy, and elegant. They will be the perfect center of attention for your living room or even your home office. 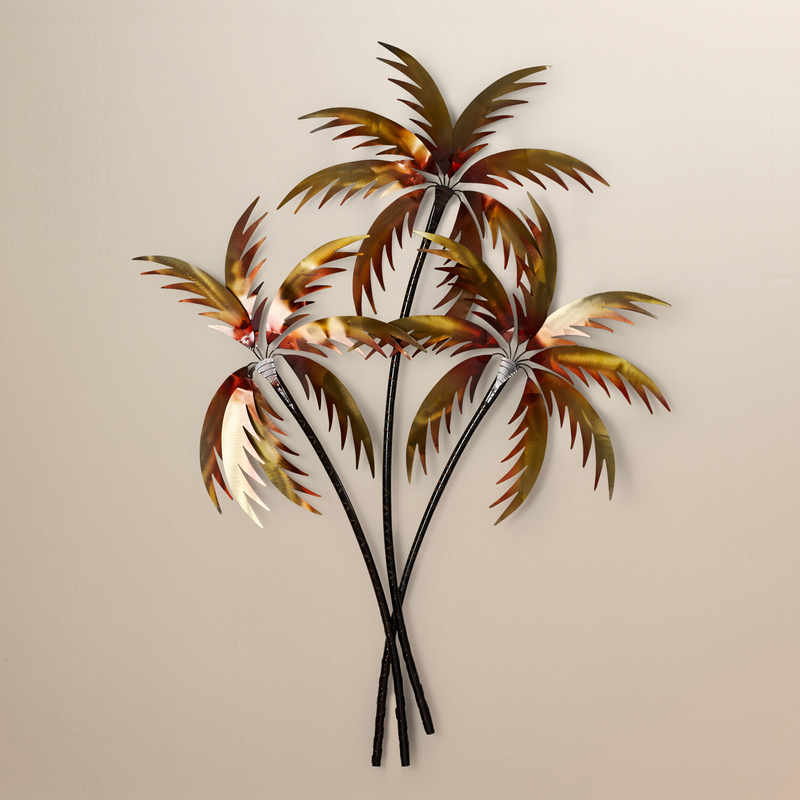 This colorful Haitian-inspired Palm Trees' Wall Décor is designed to liven up everything in the room. It’s a bold design too with an artistic feel to it. The décor is made out of recycled metal. The piece is also handcrafted, embossed, and hand painted by master artisans. It’s a custom tree design that can be used for any room. If you want something simple, modern, and classy, then this Contemporary Forest Metal Wall Décor is the best choice for you. The design features a number of small and thinly designed trees arranged carefully on a white backdrop to form a forest. The leaves on each tree are also quite colorful with different colors represented. This tree metal wall décor is unique from the others because it comes encased in a dark wooden frame. The trees inside the frame are also different. Instead of large sized trees, the artisans here have simply created branches that appear to be protruding beyond the frames with vines wrapping around each tree in the design. Bring a splash of breathtaking foliage to your home with this Tree of Life Wall Décor design. The décor will make your tired looking walls livelier. It’s a contemporary design with a class of its own. The artistic tree shaped silhouette and the almond-shaped leaves are all hand painted to deliver the perfect finishing touch. This iron-based modern tree wall décor is classy and highly unique. The design features a rectangular matte black iron frame too with additional matte cutouts for the branches. Everything is all black in color. The piece combines a number of trees to add a forest-like look to the whole design. It’s the ideal option for the modern homeowner. This Tree Metal Wall Décor by Red Barrel Studio is one of the largest pieces on this list. The acacia-shaped design will add an artistic appeal of elegance to your home. The design comes with a stunning tree motif and would be the ideal complement for a nature-inspired decor. It’s also an excellent enhancer in a modern home. With its stylish and elegant design, this Tree Of Life Sign Metal Wall Décor is the perfect mix of creativity and strength. The décor is made using high-quality steel. Its brown finishing gives it a rustic touch making it an ideal countryside option. The round shaped design makes the tree visible from the roots to the top leaves. It’s highly recommended for a laid back décor. This design features a combination of metal finishes. First, the trunk is created using strong iron while the top branches and leaves are all finished using bronze. The metallic grey appeal of the entire structure is really something to savor. The design will be perfect for high ceiling rooms due to its large size. This black silhouette tree design made out recycled metal is simple and minimalist at best. The black matte finish makes it perfectly ideal for any room. The black framing too is something to note. It adds a lot of class to the overall design. Simply put, the Metal Tree of Life Wall Décor by Gracie Oaks will make your plain walls more charming than ever before.